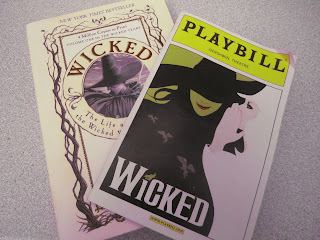 My dear friend, George, was able to get two tickets to "Wicked" through his work. He had already seen the show so he offered me the tickets to help me on my way to my 10 Broadway Shows goal that was on my 26 list. The only payment he asked for in exchange for these tickets was a shoutout in this here blog. Cue shoutout: THANKS GEORGE! I decided to bring my friend Chris as my date for the evening. At my request, he bought me a hot dog from a street vendor as a thanks for the invite (yummm). We walked over to George Gershwin Theatre (51st and Broadway) to go see "The Best Musical of the Decade" according to Entertainment Weekly. The musical was great! I really enjoyed it. I liked how I was already familiar with the storyline but it was done in such a different way than everyone is used to. The actors were really good, although I wish I had seen Kristin Chenoweth in the role of Glinda (but I was seven years too late). I felt like the actress playing Glinda (Katie Rose Clarke) was channeling Kristin a lot, as the way she was acting was the way I have seen Kristin act in "Promises, Promises" and in "Glee." (PS. 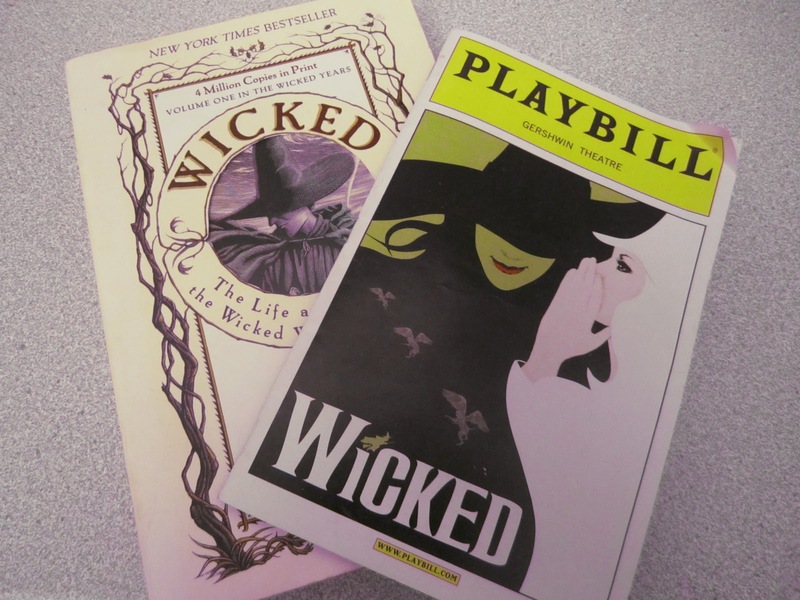 Gleeks - the song, "Defying Gravity" is from this musical.) I think the actress who played the Wicked Witch (or Elphaba), Teal Wicks, was incredible. And I was really able to relate to Elphaba when she walked into the Emerald City for the first time and got the impression that she was finally right where she belonged, since that is how *I* feel about the great and powerful city of New York. Of course, it turns out that she did not actually belong there, but that is another story. After the play, we stopped by the Shake Shack in Times Square (44th and 8th) to get burgers, cheese fries, and shakes. 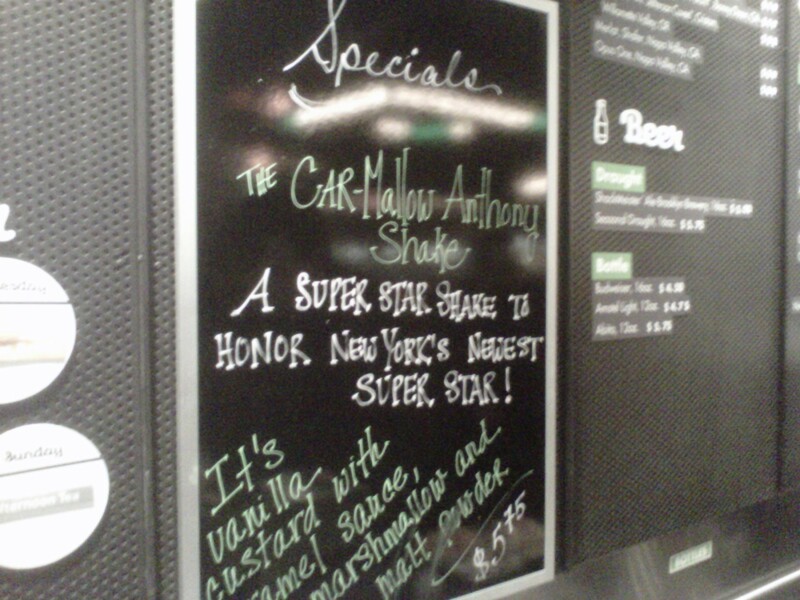 All I wanted for a shake was their classic peanut butter flavor, but I should have tried their special Car-Mallow Anthony Shake, in honor of Carmelo Anthony coming to the NY Knicks. Maybe it will still be available the next time I go. This weekend, Nicole, Mendy, Sydney and I went to Katz's Delicatessen. This was my first time eating at the Jewish deli on the Lower East Side which has been in business since 1888. That's kind of a long time ago. You may also know Katz's from *that* famous scene in "When Harry Met Sally", one of the best New York movies of all time. When Mendy and Sydney got to Katz's, the line was down the street and around the corner. By the time Nicole and I got there, we only had to wait in line for a few minutes, because it was moving quickly. Mendy isn't used to waiting in line for anything other than for a bar, so he actually got out his ID to show to the person at the door, which we clearly made fun of him for. When we got inside, we were each given a green ticket. If you don't have the ticket when you leave, they say you have to pay $50, to ensure no one tries to sneak out without paying. Nicole said once when she went, her group was accidentally only given one ticket and were kept at the door until the manager came over and finally let them leave. The line for the food counter was long and moving quickly, but we wanted to sit down. We headed to a table along the wall to get waiter service. The deli is a lot more open than I imagined and is a pretty big space in Manhattan. The walls are plastered with headshots and photos of famous (or formerly famous) people with Katz's workers. One day, I'll know I have made it when I'm up there on that wall. (BTW, Katie, I didn't see Josh Groban anywhere...) We had the honor of sitting next to Jake Gyllenhaal, Babs, and a 1998 photo of 98 Degrees. Before we got our main meals, we were handed a plate of two different types of dill pickles (sour and half sour) and pickled green tomatoes. The sour pickles were the best, although I did enjoy all three types and had never had a pickled green tomato before. I ordered a chocolate egg cream on the recommendation of one of the NYC guide books I have on my shelf. It was a glass of milk and chocolate syrup mixed with seltzer and was delicious and light and somehow lasted me through the meal although I usually sip chocolate flavored drinks up before any food comes out. Everyone at the table but me ordered half a sandwich and Matzo Ball soup. I did try the soup and it was really good, it just tasted like a big ball of saltine dough in chicken broth. I don't think I've had it before, but I would order it the next time, if only to have a photo like the below taken of me. Katz's is most famous for its Pastrami and Corned Beef sandwiches. I had actually never had either of these before so I didn't know if I would like an *entire* sandwich full of them. Since I knew Nicole was ordering Pastrami and Mendy was getting Corned Beef, I decided to just pick off meat of their sandwiches and order something I knew I would enjoy, their world famous Hard Salami. One of the signs hanging from the ceiling even says, "Senda Salami to your boy in the Army." Check out these sang-wiches. You really do have to take out half the meat in order to eat them. Also, try the russian dressing, at least on the Corned Beef. I think the next time I go I will do the Matzo Ball soup and a half sandwich of either the Pastrami or Corned Beef since I tried them and now I know I like both a lot. The really nice thing about Katz's is that you will probably have leftovers for a few days. I plan on having my third meal of salami tomorrow for lunch, and I will probably have enough for dinner as well. Much better than a whole box of Cheese Nips. Although, Cheese Nips are pretty awesome.